POLOLU – a popular American manufacturer of universal modules – has enriched its offer of miniature step up / step down converters. The new products' main advantage is their integrated protection against insufficient input voltage. Thanks to that, these converters can protect power sources against excessive discharge. This feature is especially important when using batteries such as e.g. Li-Po or Li-Ion batteries. Depending on the model, the voltage that will turn off the converter is either set to 3 V (undervoltage cut-off fixed for 3 V) or can be adjusted with a precise potentiometer from 2 V to 16 V (undervoltage cut-off with regulation). – a solder jumper to 3.3 V or 5 V.
Typical maximum output current is 1.5 A for all converters (output current depends on input voltage and output voltage. For more information, see the technical documentation). 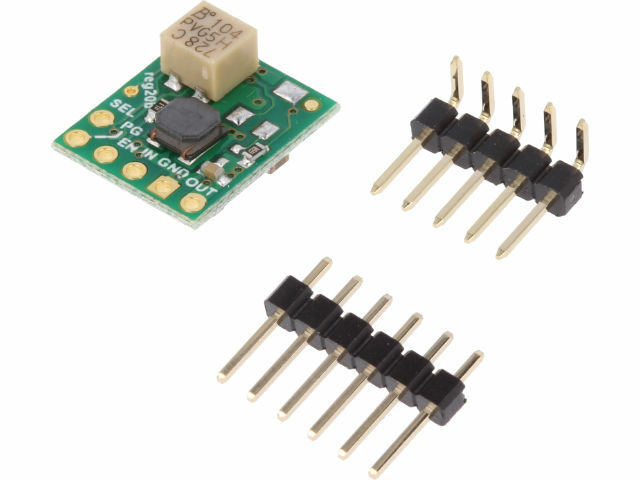 All modules in this series have integrated short-circuit and over-temperature protection. They also have a PG (power-good) output for monitoring output voltage. Due to their compact dimensions (approx. 12.7 x 15.24 mm) and integrated protection, these converters are an excellent choice for battery-powered portable devices.